Flat and low-slope roofs have been around for ages. Old technology dates back thousands of years with respect to deflecting water. Builders of old were no dummies and were quick studies when it came to keeping a structure dry. Look at old or ancient building roofs and one thing you'll quickly discover is the roofs have a great slope or pitch so water runs off fast. Flat roofs, or those nearly flat, are problematic because water finds a way. Gravity and surface tension will pull it inside the smallest crack or crevice then you have a leak. Once civilization figured out how to manufacture sheets of copper and other metals that can be soldered to create a membrane, or skin, then architects took advantage of this. I used to work on many an old building in Cincinnati that had a low-slope tin roof. I even had low-slope box gutters on the second home I owned. If installed correctly, these metal membranes will do a great job - for a while that is! CLICK HERE to get FREE & FAST BIDS from local roofers who specialize in flat and low-slope roofs. Old fashioned tar and pitch (asphalt compounds) were employed almost exclusively until 25 to 30 years ago. In fact, asphalt is still used today although its use is waning. You might be able to locate a contractor that still applies hot tar to make a roof on a flat surface. They mop the tar onto felt paper and put in many layers. It's messy and it requires significant skill to create a leak-proof roof for any length of time. Many flat roofs used to be built on top of wood structures. The wood can sag over time or the lumber itself is not consistent with respect to flatness. Anything on the roof that works to create a low spot where water will puddle is death on a stick for a flat roof - no matter what the roofing membrane is. The new membrane products began to appear in the 1950's. The explosion in the synthetic rubber industry and the plastics industry helped fuel this growth. The result are flat roofing products that enable you to basically "shrink-wrap" your roof! Prior to the advent of these products, you knew that if you bought a building with a flat roof, dealing with leaks would be inevitable. The new membranes while much better than hot tar and asphalt, still had some growing pains. One thing you need to understand about any roofing material, even a metal like copper, is the sun's UV rays are so powerful they blast apart atomic bonds. The sun can break off copper ions from solid copper causing them to wash down to the oceans. This means that breaking the bond of a rubber membrane, or some other hybrid plastic/rubber membrane is child's play. To slow this breakdown you need to put rock on the roof. Roofers call this ballast. The stones have a SPF rating of about 10,000 if you completely cover the membrane with the stones so no sunlight can reach the membrane. There are three major types of flexible roofing membranes. All of them are fairly complex and some have names that you can barely pronounce. I happen to like the products in the first group - those being the thermoset types. These materials are ones that chemically crosslink. What that means to you is that once seams cure you have one giant molecule of roofing over your head and possessions. That's a huge advantage. Many of the synthetic rubber roofs (EPDM) fall into this category. This is my favorite membrane roofing material. If you need to put on a single-ply membrane, go for EPDM. It comes in wider rolls. CLICK THE IMAGE NOW TO BUY THIS MATERIAL. You also find the CSPE, CR, and ECR compounds/membranes in this group. These membranes are fairly thick and often you will find them in thicknesses between 30 and 60 mils. These roofing materials offer superior performance over a wide range of exposures. If applied according to manufacturers recommendations, they will give you leak-free performance for many, many years. These membranes are very similar to the Thermosets, but there's no chemical cross-linking or vulcanization. Seams in the materials are welded together with solvents or heat. The welds - when done properly - are as strong as the material. These are "code" acronyms you might hear the roofer talk about. Be sure to ask exactly what type of material you are getting so you can see which group it falls into! These membranes combine asphalt with modifiers and reinforcement materials. They are often a "sandwiched" roofing material. These materials can perform well in my opinion but they are not as advanced as the other two groups. These materials are often referred to as "torch-down" roofs because a large flame throwing torch melts the asphalt so that seams can be joined together. You might hear your roofer mention the names APP or SBS when referring to this membrane. These are my least favorite membrane roof. I guarantee you'll not get much leak-free service life if you use one. Hi. Have metal R panel metal building. Where the roof meets the walls, a 'V' metal corner was put on. When the wind blows rain against the buliding, the building leaks at these junctions. Thinking of taking off 'V' panels, putting roofing membrane underneath, then putting 'V' panel back on. Do you think this would cure leaks, or do you have a better suggestion? You need to talk to me. Click the SHOP icon at the top. Choose Consult Tim. Have a Kalzip roof gutter overlayed with a TPO lining. The seams appear to be not sticking causing water ingress to one area. I have overlayed repaired the seams with TPO weld strips & then a coating of cromapol scrim coat for second defence.. Would you consider this to be a satisfactory remedy? I would send a photo to the manufacturer of the TPO lining and ask them. Hey, we recently had a membrane roof installed on a 100 year old building. We also had them do 6 inches of iso right on top of it because we were going for the open rafter look where you can see the bottom side of the decking. Fast forward to the fall we had some leaks around the edges. The roofer said that is do to frost accumulating in the iso and then it warming up to moving the edges where there is a gap and coming out. He suggested I spray foam the one edge(about 15ft worth) and that should fix it. Not long after that winter struck and it hasnt warmed above 30 until yesterday. We have also had about 6 inches of snow in the last week. Yesterday I had more water in my building than when the original roof existed(it was bad). He came over and said I now need to spray foam the entire edges of the interior of the building. So I guess my question is if this is a reasonable explanation and fix to our problem? Im assuming that we do have some frost but yesterday when the snow started to melt off we had leaks we have never had before. He said it wasn't anything wrong with the roof but conceded that possibly the way he did the iso is allowing air in to it allowing it to freeze and thaw creating puddles that are now turning into falling water on my customers heads. He said he would spray some insulation in the 6 spots I had leaks yesterday but that I would need to do the rest myself. My assumption is that when he "fixes" these 6 leaks the water will simply go around them and find another place to come out. Tyler, Sorry I'd have to be there to see everything and inspect the roof. Bottom Line is you got a BAD JOB. Call up three EXPERT roofers and have them come out to tell you what's wrong, even if you have to pay for their visit. Best $$$$ you can spend. How do you find the BEST roofer in your area? Easy. Use my Roofing Contractor Hiring Guide. Hello, I have some sort of roofing membrane covering my exposed upper deck. It gets a good beating from the weather as I live on the beach. It is likely 20 years old. Seams appear to have been likely heat sealed. It is perfect really for this application. No leaks thankfully. A few weeks ago I had a new roof installed and the workers damaged the membrane with a 6" tear. The contractor wants to fix it by NOT REMOVING THE DECKING, but covering it over with another membrane. Is that a good idea? Or, should the damaged roofing membrane be removed first. When did Thermoplastic membrane welded systems start being used? Is there a year when they came out? I have an 1100 sqft walkable flat roof. I live in the mountain at 7,000 feet so the freeze-thaw heat/cool occurs almost daily with a large variance in temperature. I need a really well priced solid roofing solution. Could you recommend? Is PVC roofing as good and long lasting as EDPM. I have a flat roof on my building and the roofer recommends PVC over EDPM because there is a restaurant in the building. If the roof will support the weight there are many systems you can lay on top of the roof that lock together. Just call the manufacturer and ask what they recommend. or you can build a deck that just lays up there, no fasteners into the roof! Be sure to put a slipsheet under the deck. The EPDM system does not glue together molecularity and the seams are notorious for degrading and causing the entire roof system to fail. 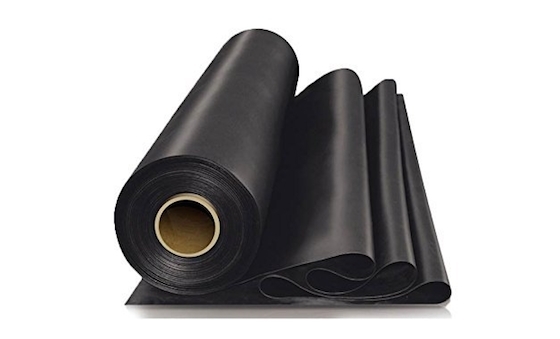 PVC and TPO seams are far suppirior to EPDM, just wanting to let you know the seams on EPDM are basically contact cemented together and then caulked to protect the contact cement from water. if the caulk is missing or even one spot comes off or has a hole in it then often water will degrade the contact cement. what's the maximum pitch on a roof to use a membrane roof? also what about snow will I create problems sliding off or causing problems with my gutters. Can roof membrane systems become "clogged"? Is there an optimal material/method to use beneath a pedestal supported paver field?